In the summer of 2003 MusicYo was in the process of reintroducing the venerable bound Newburgh style GM guitars. On a Summer NAMM visit to the factory, we were informed that one of the first three Newburgh GM's made was going to be used for a custom creation. It was going to be done by a third party but the request came through Henry Juskiewicz. A short time later we made the acquaintance of the person behind this creation. His name is Eric Kirkland and he's a professional player and gear reviewer, most notably for Guitar World Magazine. He also consults in high-end audio and contributes to other publications/websites. He admittedly has a "soft spot" for Steinbergers and with their renewed interest wanted to put together a unique instrument. Initial artist rendering of horseman body art. 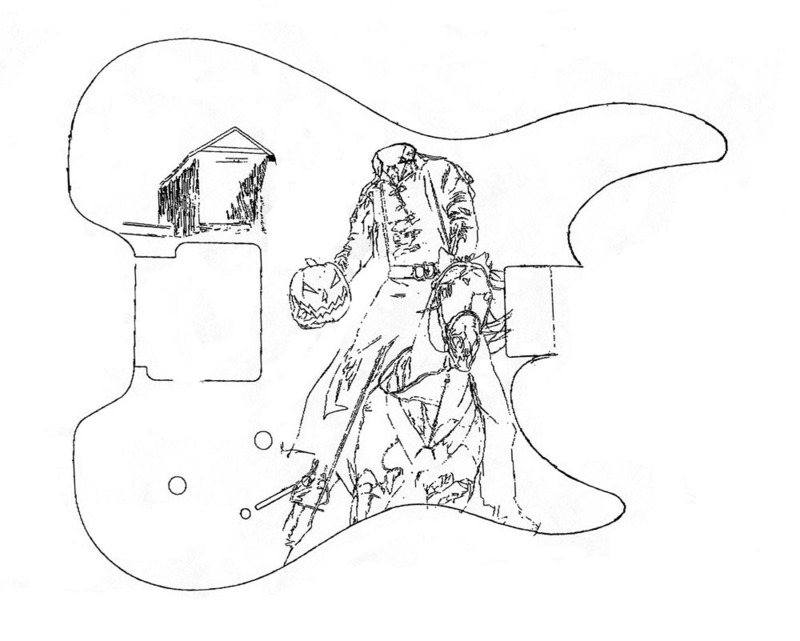 Early sketches for the neck inlay. Note the use of the jack-o-lanterns as the position markers. Q: Steinberger isn’t currently a “popular” brand. How did you get interested in them? A: I started playing guitar in ’87, when speed and technical virtuosity were the goals of most young players, including myself. The radical engineering and mechanical innovation offered by the graphite material, TransTrem bridge and headless design was an irresistible means to this end. So, I’ve been a fan of the guitars for a long time and have always intended to own one. Q: What was the inspiration for the guitar? 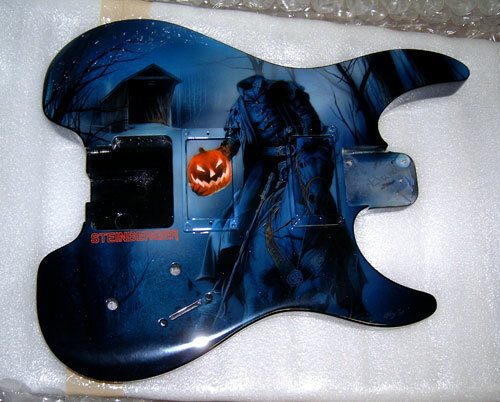 A: In the fall of 2002, just before Halloween, I ran across a Steinberger ad in one of the guitar mags, which prompted me to do some research on the status of the brand and perhaps locate a Newburgh on eBay. While on my typically late walk that night, the Northeastern seasonal atmosphere of cold, wind, fallen leaves, bare trees and pumpkin-adorned doorsteps got me thinking about my favorite short story: Washington Irving’s, The Legend of Sleepy Hollow (1819-20). I immediately made the connection between the Headless Horseman character and the headless Steinberger guitars that I read about earlier in the day. 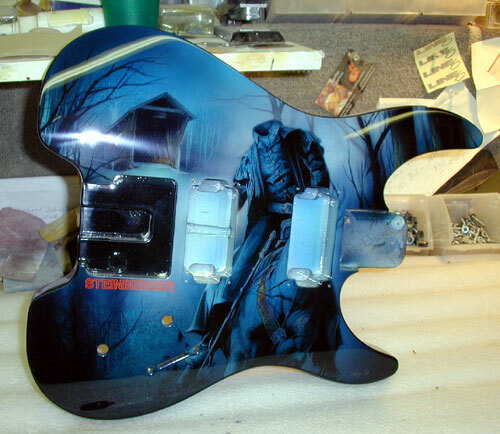 Many guitars have been used as a canvas to display a player’s personal passions, but this idea represented the first theme guitar (that I know of) that was directly related to/inspired by the guitar’s actual design. Q: How did the process take shape? A: I had a terribly busy winter, so it wasn’t until the spring of 2003 that I started making phone calls to assess the financial and logistical feasibility of the project. I began with a call to Jim Rosenberg, of Epiphone and MusicYo. He gave me a timeline for the Newburgh reissue production and confirmed that he could supply me with the parts in their semi-finished states. I should mention that Jim has been very helpful and kind throughout the process. After I had the parts ordered and initial decisions made, it was matter of finding and calling the appropriate artists and other industry contacts, including introducing myself to you. Q: Who and how did you choose the artists to do the custom work? A: There was a lot of luck involved here and maybe some destiny. I had met Pat Wilkins (Wilkins finishes) while researching another guitar about a year prior. Pat is one of the world’s premier guitar painters, a very fine builder and happens to know just about everyone in the industry. He turned me on to this guy that used to work in his shop: Chris Compston. 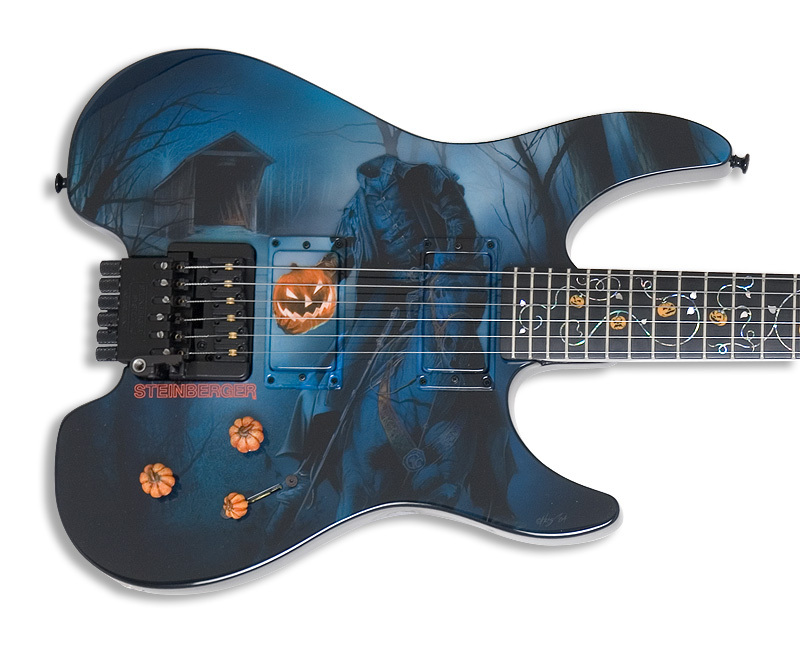 Chris is a mind-blowing graphic artist and considered to be the best there is for photographic realism on a guitar. The funny thing about finding these unique artists is that once you meet or become acquainted with one of them, you’re wired into the underground network of artisans. So, it wasn’t long before I was calling Ron Thorn (Thorn Inlay) and Stephen McSwain (McSwain Guitars). 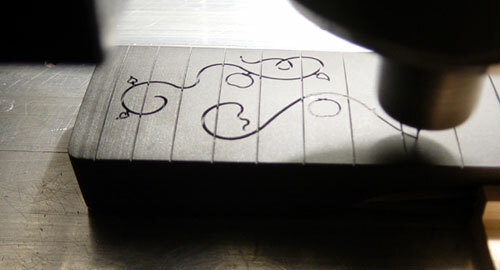 Ron is a super-talented inlay specialist, graphic designer, master luthier and CNC programmer. McSwain is a totally sick industrial artist and maybe the only guy out there that specializes as a guitar carver. These four guys have so much high profile and big company work to their names, I can’t even begin to start listing it all here. 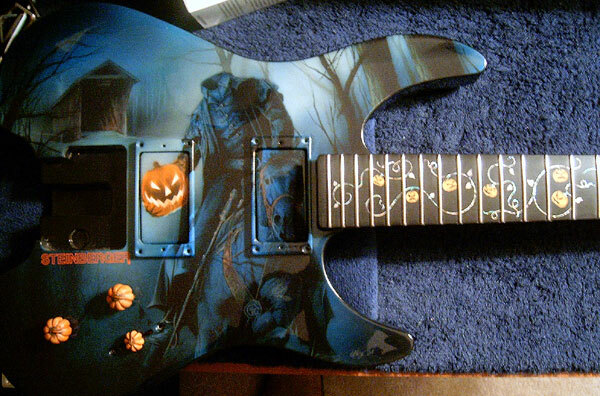 All of the artwork on this guitar is completely original. And, since Halloween and jack-o-lanterns are more of an Eastern and Midwestern obsession, the California guys (Chris and Ron) got their inspiration from various things. 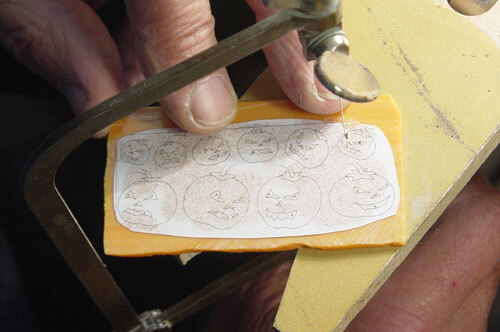 Ron Thorn used Disney for pumpkin images and Chris Compston went nuts doing weeks of library and film research on the story, covered bridges, saddle leather, period dress, 19th century harnesses and stirrups, etc., before he even began sketching. 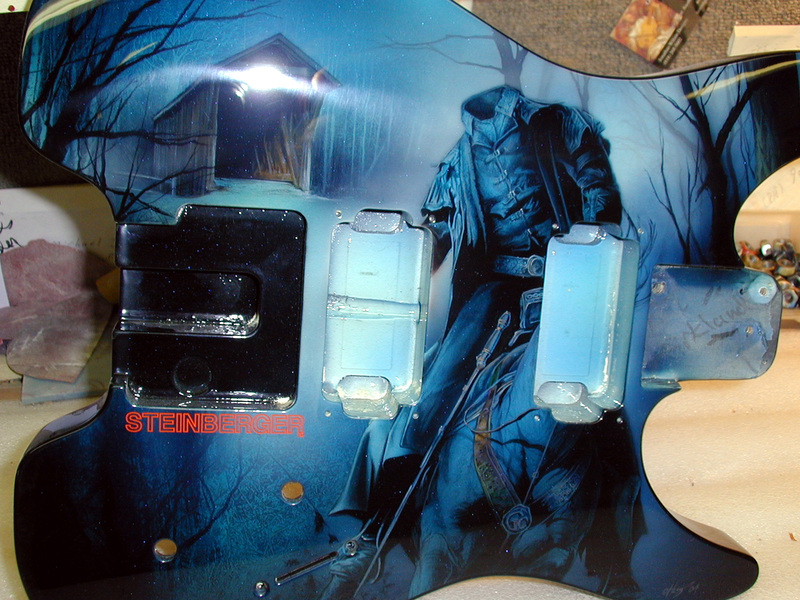 Front shot of the finished body. Click on the photo for a larger resolution shot. Another slightly closer shot of the body. Click this one as well for a larger res image. The detail & depth that can be seen in the artwork is astounding, even for a low res web image. This is a lower light shot with the painted pickups and rings installed. Kirkland added that "the detail is FAR more than what is seen here. Chris went as far as hand painting all of the embroidery and double stitching on the horseman's collar and cape, boots, coat. I'm told that the detail is totally sick and that these pics show nothing!" Routing the custom inlay pattern into the neck. Cutting the completely unique and theme appropriate position markers. 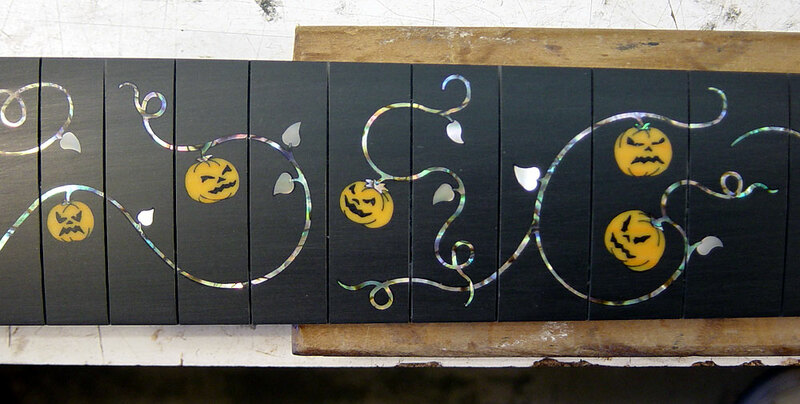 Gluing in all the intricate inlay. 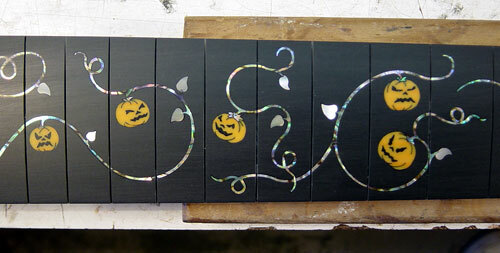 The finished inlay. Click on the photo for a higher resolution close-up. The back of the body is being repainted to a color that more closely matches the overall theme and the colors on the front. Work has begun on a custom hard case for the guitar. It will open opposite of a standard one - i.e. when it opens you will be looking at the guitar in a display fashion. When most cases open the guitar is upside down, which makes it easier to pick up and play. Parts should be in Kirkland's hands within two weeks. However other NAMM obligations for himself and others mean assembly before February is highly unlikely. Neck, body & custom knobs have arrived. Below is a quick camera phone shot of the them together. Kirkland has been really busy with other priorities, so no work has progressed. However the parts are headed off to Nashville for final assembly very soon. Parts arrive at Epiphone on October 1st. During the neck two weeks they complete the assembly process. Below are several photos taken by the Epiphone art dept. These are low resolution. Original high resolution pics should arrive on CD shortly and will post those the moment they do.